I woke just before dawn. It was Saturday, August 23. The breeze was crisp as I sat up and put on a sweatshirt. To the east, clouds were being broken up by the oncoming glare of the Sun. Breakfast was an apple and a can of V-8. I’d read that the camp had showers, but I couldn’t find them anywhere, and I was too impatient for to wait for the park ranger office to open. I pulled out of camp just as the Sun was rising. The eastern mountains were even more beautiful as I would my way back towards the interstate, sunlight filtering through the clouds like Sunday morning in a medieval cathedral. Coming over the crest, the valley ahead greeted me with the sight of magnificent red cliffs, ruddy and vibrant. 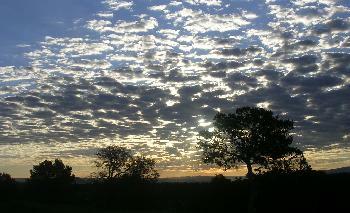 It was like the Earth itself was rising to greet the dawn. Satori clicked over 215,000 miles coming over that ridge. Near the Continental Divide I crossed the bridge over the interstate and turned down the two-lane service road. Was I on the original Route 66? At the Continental Divide, I stopped for a picture. Neither of the stores there looked open. So, I continued down the highway and stopped at the Pilot truck stop I’d stopped at years before. Nothing much had changed. I had a cup of tea in the restaurant and got caught up on my writing. The waitress kept checking up on me. I felt super grungy, so I sprung for one of those trucker showers truck stops often have. It cost $10.66, just like the year. For that, I got my own little bathroom, with a toilet and a shower with a towel and everything. There didn’t seem to be any time limit for using the shower rooms. If they delivered food there, a guy might not ever have to leave… I got clean, got some gasoline ($3.65 a gallon) and hit the road. I decided to spend the day checking out as much of the original Route 66 as was still intact. I got off the highway and went through Gallup. I followed the old Route 66 trail through town, past decades-old businesses, shops and old motels. I stopped at the Cultural Center to get a picture of the Code Talker statue, then followed the 2-lane road until it crossed some railroad tracks and disappeared into the rocky hills. Pretty yellow-green flowers dotted the shoulders of the highway, highlighted with patches of black-eyed Susans. I was never that taken with the "romance" of Route 66. Living along Route 66 in Oklahoma for years, it's easy to become cynical. Every store you go to has Route 66 stuff: t-shirts, shot glasses, refrigerator magnets... and in many cases it's the same stuff, over and over. Living in an environment like that, Route 66 seemed to symbolize everything wrong with the economy-- trivializing important, historical events into cheap trinkets just to squeeze every last penny out of tourists. But then, I went to England. The bus tour took us to lots of neat places, sites I'd dreamed of seeing my whole life. Objectively, though, lots of places we visited were little, out of the way towns-- villages I might have passed by withouth a throught, places where the only reason for visiting at all was because of some obscure monument, or because some famous person once lived there, or because some general that just got the crap beat out of him ran through there like a wounded puppy. In lots of cases, these attractions were the only things keeping those little communities alive. So, why not sell trinkets? Why not put pictures on shot glasses and magnets? In their own way, souvenier trinkets keep cultural heritages alive, remember historical events, and show respect for remarkable individuals... and if it helps somebody put food on their table or keep a roof over their head, more power to them. The highway meandered its way between two rugged ridges towards the Arizona border. Shadows from clouds danced across the cliff faces. At 11:28 Oklahoma time, I crossed the line into Arizona. The chilly night before made me interested in finding some extra blankets. A sign advertising inexpensive rugs brought me to Chee’s Trading Post. (I also liked their sign: “Smile, say Chee’s.”) The “rugs” turned out to be, technically, “placemats,” but I bought a couple of pretty rocks anyway. Back on the road, Exit 346 announced I’d reached 6,000 feet in elevation. By Arizona time, it wasn’t even 10 AM, but I’d already traveled 90 miles since dawn. The land flattened out into gently rolling prairie. I crossed Crazy Creek at mile marker 323, and seven miles down the road I crossed the Dead River. Colorful bands of rock began to poke out from beneath the topsoil as I approached the Painted Desert. The Petrified Forest was off at Exit 311. I noted that Route 66 veered off to the south of I-40. Ahead, dinosaur statues appeared alongside the road, landmarks that I was getting close to Holbrook. Near Exit 303, I passed a whimsical statue of a 2-headed dinosaur—something that I doubted was supported by the fossil record. There were more statues at Stewart’s on Route 66, but I’d visited there years ago. I listened to “Car Talk” on the radio. It turns out shock absorbers are important for a car’s health even if you don’t mind a “bumpy ride.” They help keep the wheels all on the road. 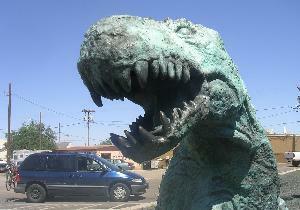 There were more dinosaur statues when I got off the highway at Holbrook, one of the landmark Route 66 towns. Hopi Drive was on the original route; that’s where I passed the Wigwam Motel and a classic movie theater called the Roxy was showing “Hellboy II.” There was a dinosaur statue and a closed barbecue place called Bubba’s. The end of Hopi Drive links back up with Interstate 40. It was 25 miles to Winslow, Arizona. Big mountains appeared on the horizon. 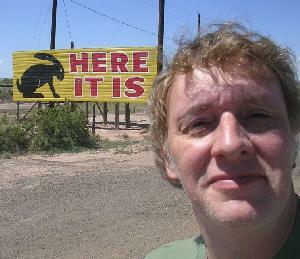 Between Holbrook and Winslow, I pulled off the interstate to visit the Jackrabbit Trading Post. Made famous by the iconic "Here it Is" sign and jackrabbit silhouette, it's a fairly large general store on the old highway. I made a pit stop and looked through their Route 66 memorabilia. They sold booze, too. There was a giant jackrabbit statue out front, but there wasn't anybody else there to take my picture astride it. I bought a refrigerator magnet. Down the road, I turned off the interstate. I planned on going through Winslow, but there was something I wanted to see first. Just a couple of miles north of Winslow are the Homolovi Ruins, a 14th century Anasazi site—except I found out they don’t like using the word Anasazi anymore. The Hopi prefer they be called the Hisat’sinom. Again, there was nobody at the gate when I drove up, so I dropped my $5 fee in a slot and drove on. It was a state park, but mine was the only car on the narrow roads. It’s a lonely place, with hardly any signs. There were a handful of campers in the small campground. I went to Ruin Site I, my car the only one in the parking lot. Through a small gate, I walked along an unmarked path over the crest of a hill. There were no signs, no marked paths, only some little flags on wires. I found a couple of walls, build with mud bricks, half-buried in the ruddy soil. Some mounds, and scattered bricks on the ground. It must be frustrating for archaeologists, I thought, to find something like that and know it was the site of some ancient center of culture, but to others it just looks like a pile of bricks. I looked through some more rocks, but my gas tank was getting low, so I skipped the visitor center and headed on into Winslow. 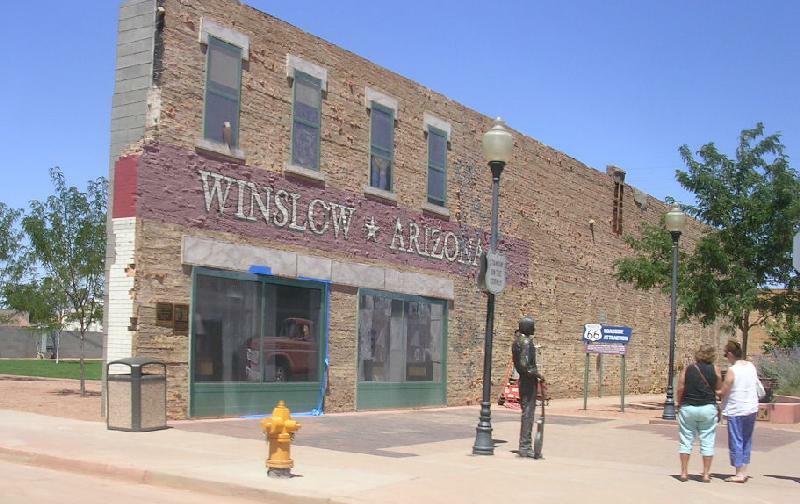 The restored Standin' on the Corner Park Gas was $3.69 a gallon in Winslow, elevation 4,850 feet. I was pleased to see that Standin’ on the Corner Park had reopened. The building area that used to be next door had been planted with grass and trees. The wall with the mural had been reinforced with supports on the rear, and people were on the corner, taking pictures. I drove down the interstate for a while, then stopped at a roadside park near Meteor Crater for lunch: hard-boiled eggs and an apple. The state very artfully built the park around some unique rock formations. To the west, it looked like a storm was brewing. It was mid-afternoon when I resumed my journey westward. As I passed Twin Arrows, it looked even more run-down than the last time I went that way. I crossed Diablo Canyon without stopping. The closer I got to the storm, the cooler the air became. The sky grew dark. Lightning flashed to the southwest. I could see the gossamer curtains of rain dangling from the low-lying clouds. About an hour after leaving Winslow I pulled into Flagstaff, Arizona. The first drops of rain hit the windshield just as I crossed the city limits. The rain came down steady all the way past Flagstaff to the Arizona Divide, 7,335 feet above sea level, then slowly petered out. The clouds broke up, and it turned into a fine drive, with mountains and wild flowers and big white clouds. It was at Williams, Arizona that I found a classical radio station, which put me in a contemplative mood. A little over an hour past Flagstaff, I pulled off the interstate again and got back on Route 66 at Seligman, “the birthplace of historic Route 66.” I spent most of the next hour driving the original route, the trail bypassed by the interstate. Once I got past an old pickup, I was alone on the old 2-lane asphalt, its surface cracked and patched from decades of use, streaked with varicose veins of tar. There were Burma Shave signs on the old road! They looked pretty new, so I don’t know if they were vintage signs, or new signs put up by historians. One said, “Train’s approaching /Whistle screaming /Pause! Avoid that /Rundown feeling.” It was a lonely drive, but the landscape was thrilling. I headed northwest, off the beaten trail, into the land the interstate forgot. This was traveling! When getting someplace was full of mystery, danger and adventure. I couldn’t stop smiling. A ridge of mountains off to the east followed the road from Chino Point past Rhodes Canyon, pointing towards Blue Mountain. This was the view thousands of travelers saw before 4-lane superhighways passed them by. The wind picked up. A pair of prairie dogs scampered across the hot road. Old Route 66 goes in pretty much a straight line through the arid land before turning into towards the hills. I passed the turn for Grand Canyon Caverns. Nine miles from Peach Springs, a sign told me I’d crossed into the Hualapai Indian Nation. The speed limit slows to 35 going through the sleepy town of Peach Springs, about a half hour from Seligman. A sign reminded motorists to keep their headlights on day and night. I passed the Music Mountain High School, and wondered what their football team was called. The water in my canteen was hot. In the little town of Truxton, the vintage Frontier Motel seemed to be doing good business. The old Orlando Motel across the street, boarded-up and overgrown with weeds, was not so lucky. I saw more Burma Shave signs. In Valentine, I passed the local Bureau of Indian Affairs office. The old highway slowly wound down into a sharp valley, the late afternoon sun beating down from a cloudless sky. Clumps of cactus sprouted across the surrounding rocky hillsides. My cellphone declared “no service,” and I had trouble finding a radio station. At the turnoff for Hackberry, I was still 25 miles from Kingman. At mile marker 75, a store displayed a big, green Tiki head out front. I kept thinking I should’ve gone back for a picture. The road turned into a wide valley. Traffic picked up, and the road widened to a 4-lane. I passed a road called Diagonal Way. I arrived in Kingman just before 4:25 Arizona time. That’s where I left Route 66 behind me and turned onto Highway 93—which put me back on Interstate 40, but not for long. I soon pulled off the interstate and started a long, slow slog up Highway 93 towards Las Vegas, 100 miles away. To the east, Chernum Peak and Packsaddle Mountain loomed as I zoomed out of Arizona. To the west, the Black Mountains cast their shadows across the wide Detrital Valley. The sun was bright on my left shoulder. Highway 93 is a comfortable 4-lane road until you get to mile marker 17, the beginning of the Lake Mead Recreational Area. I never fail to be humbled by the gargantuan mountains on the approach to the Colorado River. As impressive as the construction of Hoover Dam was, just getting to Hoover Dam must have been an achievement in itself. Nine miles from the border, all traffic was detoured over for a police check. As I slowed down, the officer looked me over, then waved me on. I don’t know what, or who, they were looking for. An hour and 20 minutes after leaving Kingman, I reached the Hoover Dam, and was surprised to see the makings of a bridge being built high over the entire gorge. It rose up and up about, oh, a million feet in the air. Would I go over it when it was completed? Hell no! 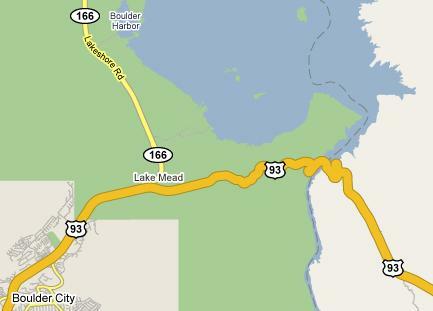 On the Nevada side, I pulled off the highway and turned towards Lake Mead. My destination was the Boulder Beach campground. The park ranger charged me $5 to get into the park. At the campground, I put $10 in an envelope, and I had a place to sleep for the night. The campground was fairly empty: 150 campsites, and I counted about 5 other people. Tall eucalyptus trees shaded the campsites. I found a spot about 30 yards from the bathrooms, but completely hidden by trees and bushes. I made myself at home. I got out my camp chair, ate my last two hard-boiled eggs (still good) and relaxed with a beer. The wind whispered through the eucalyptus trees, and was unfortunately still quite warm. The distant mountains caught the last drops of sunlight as the Sun crept below the horizon. I called in a voice post to my LiveJournal and relaxed. In the distance, I could hear the sigh of the highway. As darkness fell, I could see other vehicles wandering through the campsite, finding places to roost. None came near to me. They may have been boaters from the marina heading home. Boulder Beach wasn’t technically on the beach, but you could see it plain enough. Dusk fell, and overhead I could hear jet planes headed for Vegas or points beyond. The breeze died down, then started back up again from across the lake. I decided I liked New Mexico beer. I settled down for the night. By my calculations, I’d traveled 499 miles that day, traveling from sunup to sundown.